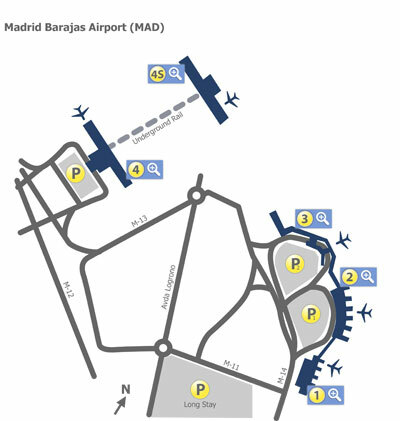 Terminals 1-2-3 are adjacent and host Star and SkyTeam alliances and are all connected airside. International from Terminal 4-S (satellite) (Except IB or I2 operated flights to UK and Ireland as well as BA CityFlyer flights to LCY that operate out of T4 Main, though note that usually one IB flight to LHR daily is operated by an A330 or A340, these flights go from T4-S). Both connected by an underground train, though going from T4-S to T4 requires going landside and re-clearing security in order to access T4. Terminals are connected by a landside shuttle bus service. Connecting from non-Schengen to Schengen (or departing the airport) one must process immigration in T-4S. Queues can be lengthy at times; if you are an EU citizen, you wil lfind the kiosk to your right in the queues. If you are not, keep to the right of the general queues anyway, as the EU queues can empty and they begin waving non-EU passengers into the EU lines. The train connecting the T4-S satellite to T4 must be accessed via lifts or stairs; the lifts are faster. A non-Schengen to Schengen connection can take an hour or longer - A 1.5 hours is recommended as minimum connect times, and possibly more for Schengen to non-Schengen if during busy hours due to security procedures, particularly for US flights. Status passengers on Iberia flights to the US have access to a separate priority queue to clear the extra US screening. Connections to other terminals are by a landside shuttle bus located, and can take rather longer than one might think as T4 is quite far away from T1/2/3. There is a metro link between the two, however you will have to pay full fare and even for a single rider a taxi is pretty competitive on price when the airport supplement is included. I would pick Plaza Mayor over Puerto del Sol. More interesting stuff in the immediate area. Tapas bars below. Market right next door. Yes, it is walkable. T1-T2-T3 are all together, the ones that are (very) far are T4 and T4S. You do not have to pick up your luggage in MAD. You do have to go through security. There's plenty of time and you should be fine. My flight times have changed and I only have 1 hour 40 minutes for a transfer from a Delta ATL-MAD to an Air Europa MAD-LIS. Still T1 to T2, I think. I think I will be okay, right? I'll be arriving from the states at either T1 or T2 in Madrid. (It's a United Airlines ticket, but operated by Lufthansa.) I have a departing Vueling flight from T4 2.5 hours after my arrival. Do I have to clear immigration before leaving T1/T2, and is 2.5 hours likely to be enough time to make my departure in T4? Plaza Santa Ana is also close by. Surrounded by outdoor eateries. No immigration on flight from FRA. And that's not doable with luggage, close but doable with hand luggage only. You'll have to get the landside bus to T4 and reclear security. Not much room for delay though. Assuming that my flight is on time, is 1:40 enough time to clear passport control, go from T1 to T2, clear security and board? Any hints on time savings? T1 and T2 are connected both airside and landside. If this is on one ticket, then you have lots of time. If it's on two tickets, then it'll be tight with bags, but doable if everything is on time. If you just have a carry-on and check in online with your BPs, then you should have a good 30-45 mins to relax before your flight starts boarding. Thanks for the info! Appreciate it. Now if Delta just stays on time, or at least close to it. Do you think a Terminal 1 to 4S transfer is doable in 3 hours? Looking at a Ryanair flight (from Canaries) that lands at 1:30pm and then an Iberia flight departing to the US at 4:30pm. Only carry-on so will not be dealing with checked bags. If it’s too tight, what’s a reasonable time to allow for such a connection? That's perfectly doable if you land on time, or even with a relatively minor delay. But of course it depends on your risk tolerance and how much it would cost you to buy a new flight to the US if you are more badly delayed. Personally I'd probably go for it with 3h, but not less than that. If there's a similar timed IB flight from the Canaries for not much more (or bookable with avios) that may be preferable. I made it with plenty of time to spare. I did have to clear security again, but was literally the only person in line. A second person came up as I was going through. It seems to be a dedicated site just for transfers. That being said, it depends on where your gate is to determine how long of a walk it is. 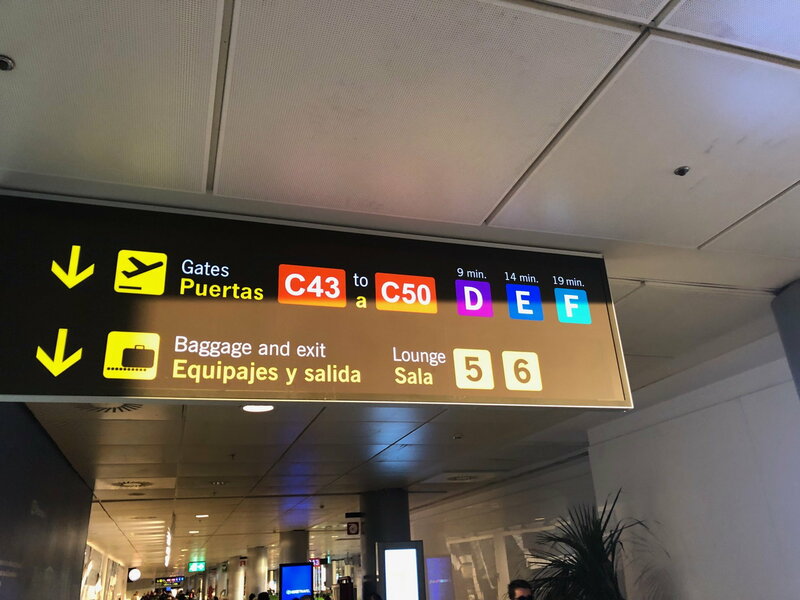 It is about a 10 minute walk from 1 to 2, but then further to gates D, E, or F.
Is T4-T4S connection on separate ticket, non EU passport doable on 1 hr 55 min connection? Should I take the chance or forget about it and fork out more than double my original ticket price for the connecting flight? I have a MAD-DOH-TYO award ticket on QR departing from T4S, and a separate ticket on IB3723 AMS-MAD 12:10-14:50 to connect. OWE. The MAD-DOH flight was originally 17:40, then moved to 17:10 and then moved forward again to 16:45, making what was originally OK connection very tight, albeit still slightly above the MCT of 90 min. Am very angry with QR cust rep non caring attitude who says ‘we never promised you a particular time of departure when you book a ticket from us’. By now, given the date May 5th falls on public holiday or something, tickets are very expensive and to change the IB ticket I would have to fork out more than twice the original ticket price, not to mention having to fly at 7:35 am instead, meaning that I will miss visiting Keukenhoff which was my whole reason for transiting in AMS. Any advice/ similar experience will be appreciated. If everything is on time, it's doable with hand luggage only. Getting to be very tight if you have to recheck luggage and while there's a bit of a margin for error there's not that much. You won't have security so it will just be getting the train to T4S. I'd really try to HUCA and try and get on the late QR flight, though. Unfortunately getting on the later QR flight means i’ll miss my DOH-TYO connection, which will be catastrophic as it’s the last flight on the last day of big holiday period in Japan. So I decided to bite the bullet and cough up the extra $$$ for morning AMS-MAD flight. This gives some 6.5 hour transit, so hopefully I can sneak out to the city to have some quick look and tapas! I'm flying JFK-MAD on DL in May, arriving 9:15am presumably at T1. I'm considering booking a separate onward ticket MAD-PMI on IB for the same day departing 11:15am. Is this T1-T4 transfer in two hours a reasonable idea assuming hand luggage only? All times are GMT -6. The time now is 8:51 pm.